When we think of “travel”, we usually think of the process of someone physically transporting themselves to another location, and, through that travel, experiencing something different from what they typically experience in their home towns. And, it is that experience that I typically write about on this blog. But, travel is actually a two way street. Sometimes, the experiences of another place comes to us in our hometowns. If it weren’t for this second form of travel, us Americans would not know about many cultural institutions near and dear to us, like burritos, yoga, sushi, or reggae music. With the level of mobility in and out of, as well as within the United States of America, our culture ends up being in a constant state of flux. Case in point, I remember when I was 12 years old going out for Thai food for this first time in my life, and thinking it was strange and exotic. Nowadays, one can find Thai restaurants everywhere. It’s become just as standard as pizza, another result of experiences of other lands coming to us, in our diet. I must admit that last year, I had no idea what Detroit Style Pizza was. In fact, I had no idea that Detroit even had a style of pizza. To be fair though, having grown up partially in New York and partially in Chicago, two large cities known for their pizza, it had never really occurred to me that any place other than those two had a style of pizza. By the time I had reached college, I had pretty much, in my head, categorized all pizza into three different categories; New York style thin crust pizza, Chicago’s deep dish pizza, and everything else, with Papa Johns typically taking the title for the least offensive member of this category (in my head). But, since then, I had learned that Saint Louis, Colorado, and New Haven, Connecticut, all also have their own style of pizza. So, when my friend told me about his upcoming business venture, opening up a restaurant serving Detroit style pizza, the concept did not sound completely foreign to me. And, it helped that he did a really good job of describing it to me. Through some research on my own, I later learned that Detroit style pizza has been around since the 1940s. Yet, Denver, like everywhere else, appears to have suddenly become aware of this pizza style within the last couple of years. 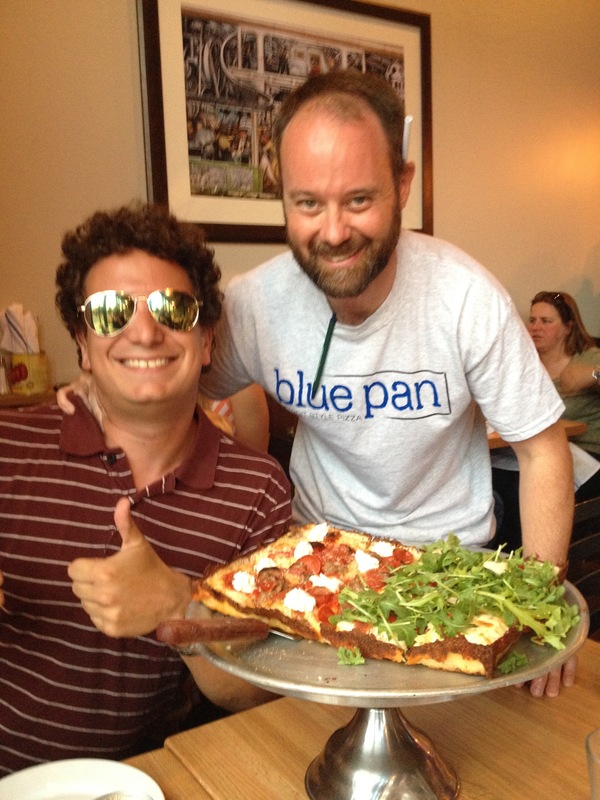 Blue Pan Pizza opened 10 days ago in the West Highland neighborhood of Denver, one of Denver’s trendier neighborhoods. It is a growing neighborhood in a growing city, with a lot going on. It also appears to be a popular place for young families. Both at Blue Pan, and at other nearby bars, I noticed a lot of babies and small children in the area. So, I guess it is a good thing that the pizza turned out to be good, thus giving me no reason to swear in front of the children in the restaurant. As a general rule, I try the best I can to go “all in” when trying something new, and get the authentic experience. So, while Blue Pan also offers standard Italian, and thin crust pizzas, I ordered the authentic Detroit style, as recommended by my friend, and restaurant co-owner Giles Flanagin. One of the pizza styles is actually called “the 313” which appeals to my love of area codes (I celebrate “Area Code Day” every year). The other pizza I ordered was called the “Brooklyn Bridge”. I ended up really enjoying the pizza, as did the rest of my party. Two other places in Denver offer Detroit style pizza. I have yet to try the other two, so I have no means of direct comparison. However, Giles had mentioned to me the importance they place on the quality of their ingredients, which I believe is why I ended up enjoying the pizza. More than having a good meal, and being exposed to a completely new kind of food, I found myself just genuinely feeling happy that evening. I was happy for my friend. I was happy for my city. I was happy for the neighborhood. Ultimately, I was happy to have seen someone take an idea, something that starts out as just a bunch of words and images inside their head, and turn it into a reality. It was right there in front of me, and completely real and completely successful. Wow! And, amazingly, although I desire more than anything in the world to be able to create an enterprise of my own, I did not even feel any envy. Everyone is better off, and one person successfully executing an idea does not preclude another from doing so with a different idea. In fact, seeing that it can be done should provide hope to all Americans who one day hope to have an impact on the world beyond just doing work and keeping a job. 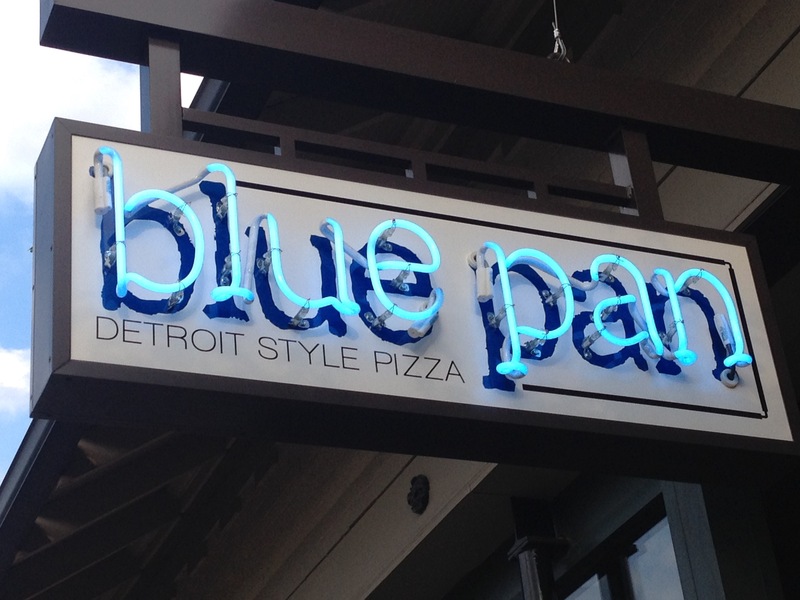 Who knows what the future holds for Blue Pan, and the entire Detroit Style pizza industry. American culture is in constant flux. Some new entries to our mainstream culture stick permanently, while others die off. In the 1990s, the cultural experience of Seattle’s coffee drinking scene traveled to the rest of the country. It stayed. A few years later, the southern cultural experience of Krisy Kreme donuts also came to us. It left. 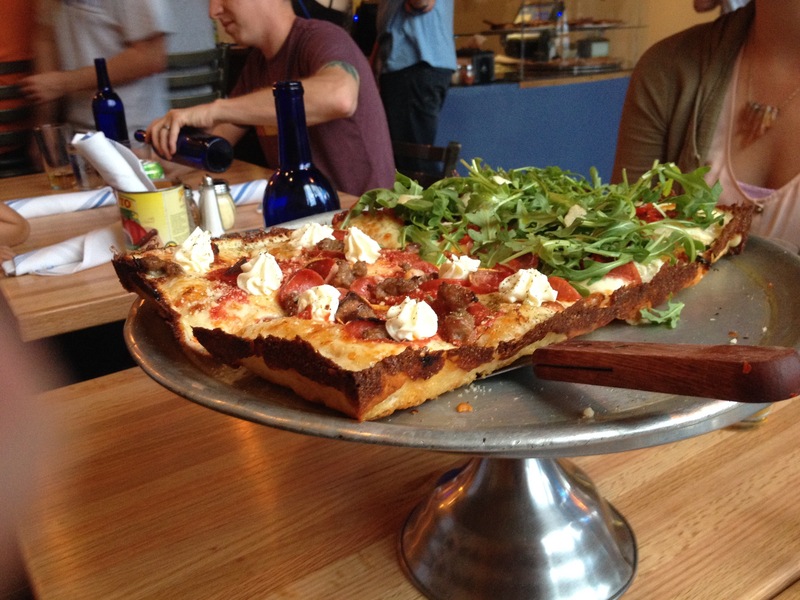 Will Detroit style pizza stay with us? Only time will tell. But, it appears to be off to a good start. This entry was posted in Colorado, culture, Denver, local culture, resturaunts and tagged Colorado, cutural flux, Denver, Detroit Style Pizza, new placs, Resturaunts, transitions, West Highland on June 28, 2015 by Stephen Jaye.